Results Based Personal Fitness Coaching. Unlock your Potential! Movement Screening- Every client has a different entry point into a fitness program. Performing a movement screen gives us vital information so we can get you performing the correct exercises to reach your goals safely! We use the Functional movement screen to guide us in providing a custom-made program unique to your goals and your current abilities. Expert coaching- Here at Strait Fitness we take pride in our continuing education and work with other professionals in the fitness, nutrition, and physical rehab industry to deliver the best possible coaching programs on the Olympic Peninsula. Private Facility- The Strait Fitness studio is a truly private training environment. Sometimes just the thought of going to the gym and not knowing what to do keeps people from even starting a fitness program. We take out all the distractions and put all the focus on making your comfortable while still delivering a safe and effective workout! We have options for 1 on 1 coaching as well as very small group training 4 clients to 1 coach. Strait Fitness will set you up for success. By providing a custom fitness program individualized to your unique needs. Strait Fitness will also provide a habit based nutrition strategy geared specifically towards reaching your fitness goals, Strait Fitness will have you on your way to looking, feeling and performing your best. Take charge of your health and fitness schedule a FREE strategy session by clicking HERE. 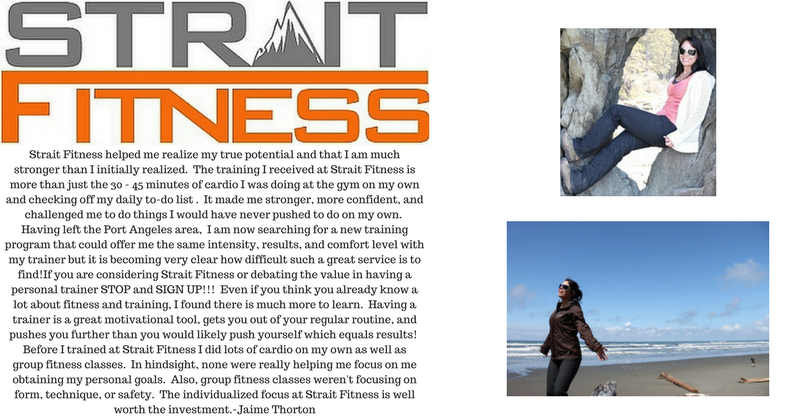 I have worked with Ben James for the last six months at Strait Fitness in Port Angeles, WA, participating in both individual and group sessions. I benefited from both experiences, and particularly enjoyed the variety and flexibility of the group work. During our training, I have found Ben to be professional and courteous at all times. He is an incredibly positive person who has extensive background knowledge in fitness and nutrition. Since working with him I have more energy, my clothes fit better, and I have improved my overall muscle strength and tone. Ben works with clients to meet their goals. For example, I wanted to train for a half marathon, so Ben worked with me to develop muscles needed for running and provided workouts that would help me achieve that goal. Within a few weeks, my cardiovascular system had improved and I was adding mileage. In addition, Ben took the time to check in on my fitness goals to ensure I was progressing, and addressed any concerns I had. While working with a client, Ben is very attentive and gives that person or group complete attention. Ben conscientiously attends to personal injuries and concerns, and focuses on correct form, whole body exercise, and healthy eating habits. Overall, he takes a very balanced approach to fitness and I appreciate his contribution to my healthier lifestyle. I would enthusiastically recommend Ben James@StraitFitness as apersonal trainer.